That’s one incredible looking dish, isn’t it? 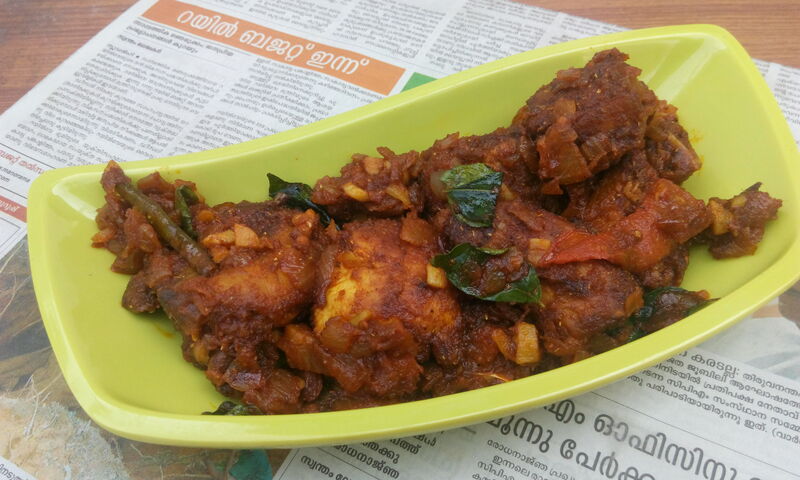 The recipe is taken from Lakshmi Nair’s cooking show- Magic Oven. It is a little time consuming as you got to marinate and fry the chicken in batches. The gravy is made and then the fried pieces are added to it. Marinate the chicken with lime juice, salt and pepper powder for about 1/2 an hour. Keep aside. Make a paste with turmeric powder and red chili powder with a little water. Marinate the kept-aside chicken with this mix and keep it aside for another 15-20 mins. 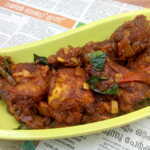 Shallow fry the marinated chicken pieces till light golden brown. You needn’t make it crispy. Heat some oil in a pan from the one you used for frying the chicken. Add garlic, ginger and green chilies and saute. Add the onions and fry till they turn brown. Add turmeric, red chili and coriander powder and saute. Add the tomatoes, salt and garam masala and cook for about 5 mins. Add tomato sauce, curry leaves and cook until you get a dry, thick gravy. 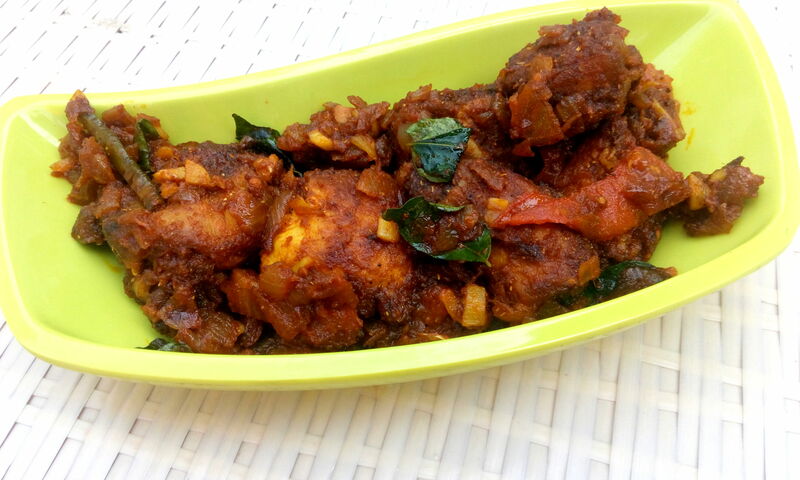 Add the fried chicken and mix well, cook till all the masala is coated well with the chicken. Serve hot with steamed rice, chapati, dosa or the likes. Shalzz, this looks delicious. Though it is a little longer to make, I am sure that it is worth the effort. Let me begin with a confession: Ever since this A to Z challenge started and you started posting these super-tempting Chicken recipes, I have been cooking Chicken at every opportunity at home. Today I’ve made it for dinner too and just yesterday Pari was asking me about what has happened to me (though she doesn’t mind my doing so). As always, what a fabulous post! Yummy. Really tempting. I will definitely try it. I love a good Kerala roast! All your recipes I will refer to when trying new chicken recipes. Thank you for bringing them on. Yes refrigeration only. Had tried it twice.